A part of a webmaster's routine is the validation of markup languages on managed websites, to make sure that the websites are displayed correctly and uniformly in web browsers. 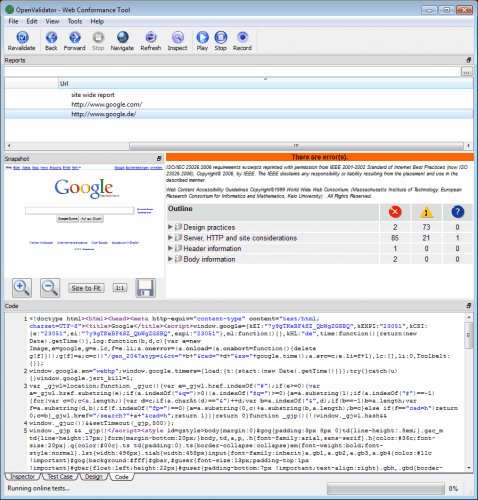 An online tool that many webmasters use is W3C Validator, which can verify the markup of a single web page, and display errors that it encounters. Webmasters with larger projects may want to use a software that can perform these validations on all pages of a website. Open Validator, the web conformance tool, can do that, and more. The Open Source software is available for Linux, Mac and Windows PCs. A wizard is displayed on startup, that aids the user in the selection of a local or remote website. Additional parameters can be defined, including the depth of recursion, the conformance tests that should be run, the document type, whether a proxy server should be used for the connection, the browser user agent for emulation purposes and pages that should be ignored. Open Validator then downloads and scans all pages that are part of the selection. This process is speedy, it usually takes less than 15 seconds for the results to appear. Large web projects may take longer on the other hand. Each page is listed at the top, with its page title and url. 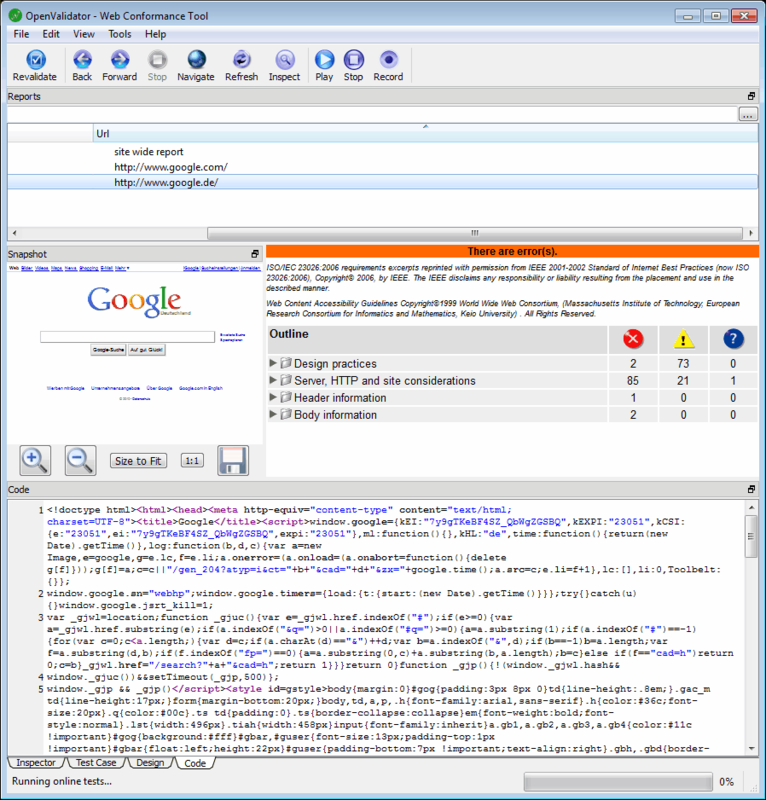 Selecting a page displays a snapshot of it as a thumbnail image, the page's source code and an error report in the lower half of the interface. The three error and warning categories are sorted in expanding tables, that provide detailed information for the webmaster. The outline column lists validation categories like design practices, server, HTTP and site considerations or Body information. Error numbers are listed in each row to give the webmaster a first overview of the number of errors and warnings on the page. Webmasters can directly edit the source code of the page, a click on Revalidate validates the page anew. This works similar to the Firefox add-on Firebug, with the difference that the changes need to be revalidated before the results are shown. Not all errors or warnings that Open Validator detects will throw an error at the W3C Validator. The software goes beyond just checking the markup, which becomes obvious for instance in the design practices category where suggestions for well-engineered websites are included in the report. The findings of the tool are very thorough, which may turn away some webmasters who may feel overwhelmed by the reports. Professional webmasters on the hand find in Open Validator a tool that can be used as a quality conformance test for their web properties. Webmasters who want to try out Open Validator can download a version for their operating system from the project website.